Commerce content is independent of editorial. It’s a curated offering of our favorite music and entertainment products on sale for our audience. SpinMedia will get a small commission on any purchases from our affiliate partners. Recently, SPIN’s founder, Bob Guccione Jr., interviewed arguably the most respected podcast host in the country, Marc Maron. During their talk, Maron covered the creation of WTF, his days as a stand-up comedian, his IFC show Maron, and interviewing the President of the United States. All of that in mind, there’s little doubt that Maron has — compared to his peers — seen the most rewarding returns from hosting a single podcast. As the medium continues to gain popularity, more and more podcasts have entered the field. According to The Washington Post, subscriptions for podcasts on iTunes reached one billion back in 2014. The biggest question in starting a podcast, however, isn’t what to talk about — it’s sourcing the best tech to reach your audience. Before you upload your first episode to SoundCloud or iTunes, you have to make sure your podcast sounds the best it possibly can. Starting with the Microphones, Maron uses two state-of-the-art Shure SM7B Vocal Dynamic Mics. A beautiful-sounding microphone, it captures vocals and the room tone with ease straight from just the recording process. They even come with a larger foam windscreen to further cut out all of the plosives in regular speech, providing clear and easy-to-listen-to vocal audio. To make the vocal processing even smoother, the best interface deal comes with Focusrite’s Scarlett 2i2. A USB interface designed to connect your microphone pair to your digital audio recording software, the Focusrite also functions as a built-in mixer, giving you two knobs for control of the gain from both audio sources and lights up red when audio is distorting. The Focusrite Scarlett 2i2 USB Audio Interface also comes with Pro Tools | First digital recording software, with all you need to record, edit, and produce your own podcast audio. To connect these devices, and, most crucially, save and backup your files, you’ll also need two microphone cables, two microphone desk stands, and two large hard drives for storing all of that audio. 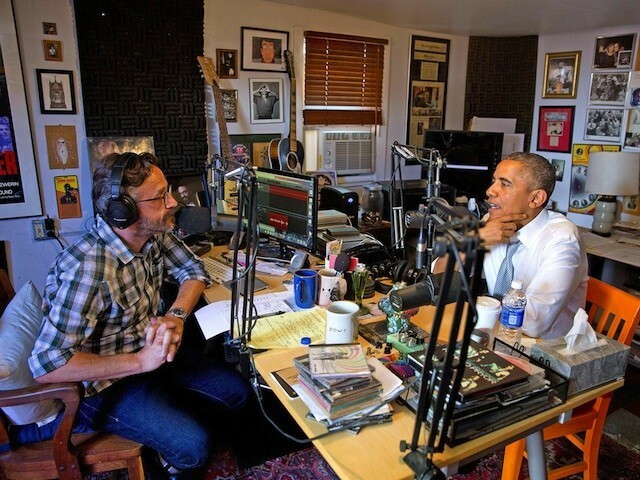 Maron doesn’t do all of his recording and mixing on his laptop, though. Sometimes he does remote interviews or even pre-mixes the audio on a Samson MDR624 mixer during the interview. When he’s on the go and not in the garage, Maron uses a Zoom H4N Digital Multi-track Recorder and two Blue Encore 200 Dynamic Mics. He doesn’t specifically know why he uses the mics, but he says they sound good and he likes the capsule’s “vintage-car” look.